As a followup to my post on interpreting Language data in Google Analytics, here’s some insight into locations as well. Data at the country level is pretty accurate worldwide; Google says that mobile devices may show inaccurate cities. Also keep in mind that a VPN can fool this sort of tracking (if you’re connecting back through the office mothership when you’re elsewhere, your location looks like the office). You get a number of choices for levels of detail. At a high level, theres Continents (kind of overly broad), Sub-Continent Regions (much better), Country/Territory (the default). Within some countries, you can also see Regions. These are the states in the US, provinces in Canada, etc. 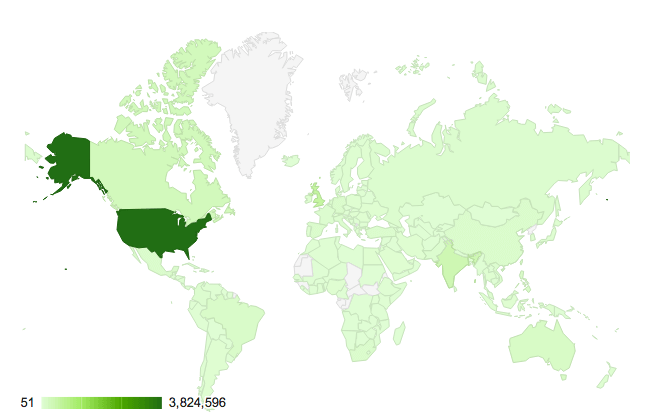 Some countries have internal region data in Google Analytics, others don’t. Worldwide, you can also see City data. Within the US only, you also have the option of “Metros”, which are basically Designated Marketing Areas (DMAs). This is a useful level of detail between states and cities. Location data can be useful for targeting your marketing and advertising and understanding who you are reaching. What level of detail is of interest to you depends on your organization: maybe you care about an audience all across the world, maybe in specific countries where you do business, or maybe only in a handful of cities where you have bricks-and-mortar locations. Lastly, what does it mean when a location is (not set)? As in any field in Google Analytics, (not set) means the information wasn’t captured for some reason. In this instance, GA could not determine where someone was located from their IP address. We looked at a large set of data from a recent 30-day period for a large site with worldwide reach, and we found about 4% of visits had a location that couldn’t be determined. More than half of these were from mobile devices, which isn’t surprising. Many of those were due to usage of Opera Mini as the browser, which actually fetches web pages to an Opera server and then sends a compressed version on to the mobile device (in which case your website never has a direct connection with the device to determine its IP address).